Has anyone here ever sculpted anything? 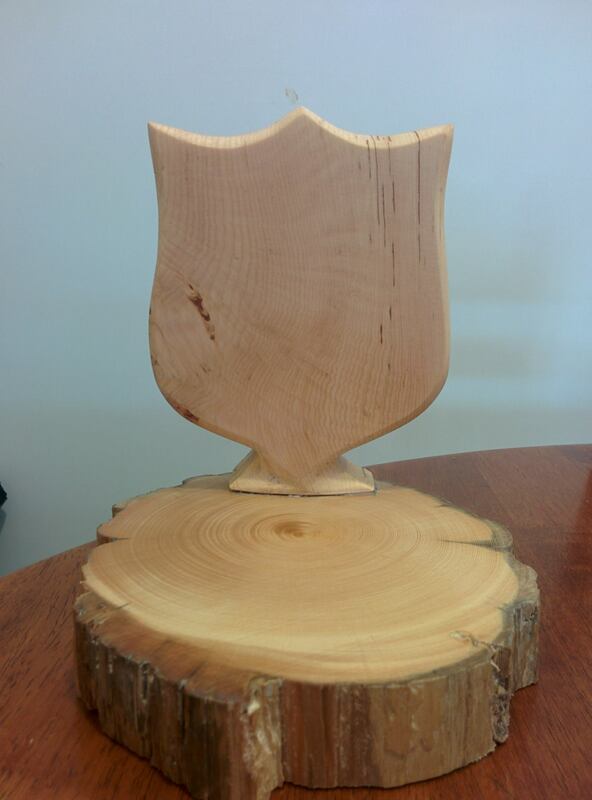 Started off with a block of something and made it into something else? You may have heard of the quote falsely attributed to Michelangelo, who apparently said about his statue of David, that he started with a block of marble, and just chipped away anything that didn’t look like David. It’s that simple! You just chip away anything that doesn’t look the way that you wanted it to look. As has been my tradition, every sermon that I preach will be posted here. This sermon, Jesus Creed was given at Fusion Youth Service at Waverley Salvation Army on Sunday 3 November, 2013. The Bible reading was Mark 12:28-34. As has been my tradition, every sermon that I preach will be posted here. This sermon, The Faith of the Bikie, was given at Waverley Temple Salvation Army on Sunday 27 October, 2013. The Bible reading was Luke 18:9-14. As has been my tradition, every sermon that I preach will be posted here. This sermon, The gifts that we bring to offer our king, was given at the Church of Christ Wembley Downs on Sunday 6 January, 2013. The Bible reading was Matthew 2:1-12. As has been my tradition, every sermon that I preach will be posted here. This sermon, Engaging with God, was given at The Salvation Army Carlton corps on Sunday 3 June, 2012. The Bible reading was John 3:1-21. 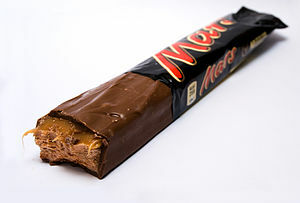 Mars Bar – without the Caramel, it’s just a Milky Way; without the Nougat it’s just a caramello, and without the chocolate it’s a great big mess – but none quite get the understanding that the Trinity is both One in Three, and Three in one. One God in Three Persons, and Three Persons in One God. The reading we heard today contains these three persons in some way, but the basic passage comes down to how Nicodemus – and how we – choose to engage with God – and in doing so, engaging with the Trinity. When Nicodemus approaches Jesus, when does he do it? Nicodemus came to Jesus at night. Why do you think he might do that? There are a few possible reasons. We read that Nicodemus was a Pharisee. Pharisees were teachers, and we read through the Gospels that they were often against the teachings of Jesus. And Jesus was often critical of them – many parables were often directed at them, and in Matthew 23, Jesus declares seven woes on the teachers of the law and the Pharisees. So you could say there was a bit of bad blood between them. 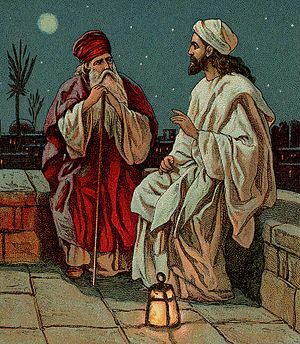 By coming at night, Nicodemus is avoiding being seen, so as to avoid the backlash from the rest of the Pharisees. And he does so with good reason. He comes to Jesus, and says “We know that you are a teacher who has come from God; for no one can do these signs that you do apart from the presence of God.” Nicodemus knows exactly who Jesus is. He has chosen to come to acknowledge this teacher from God. Our spiritual lives are full of choices. A lot of the key moments in my life have come from my choosing to engage with God. I was baptised by my dad in the Church of Christ when I was 10 – my choice to engage with God, and to follow him. A few years later, having moved churches, I chose to stay there while my parents took up ministry at a different church – my choice to engage with God, and to grow with him there. Jumping forward 10 years or so, in checking out the Salvation Army where my then Girlfriend went, I heard God’s call to ministry in The Salvation Army, and I chose to accept that call – I chose to engage with God, and to spread his Word. Coming back to Nicodemus, one of the major themes through John’s writings is the concept of Light and Dark. Basically, believers are said to be in the light, while non-believers are in the Dark. With Nicodemus coming at night, we see that he does not yet believe. I say yet, because Nicodemus appears twice more in John’s Gospel. In chapter 7, Nicodemus stands up to the Pharisees by asking whether there is a law to condemn a man without hearing from him first. Secondly, Nicodemus appears with Joseph of Arimathea to lay Jesus’ body in the tomb. Jesus engages with Nicodemus’ unbelief by saying that in order to enter the Kingdom of Heaven, he must be born again. Or born from above… depending on what translation you’re reading from. The word used, Anothen, can be translated quite validly as either option, and here, Jesus specifically used this word, Anothen, because it meant both things. Jesus was saying to Nicodemus that he needed to be Born again AND Born from above. This of course conjures up all sorts of images for a contemporary audience. We think of the Born Again Christians, such a powerful political power in the United States. Yet, in Jesus’ definition, all who are believers are Born again through the Trinity. It is in fact the whole reason that Jesus came. Verse 17-18 states “God did not send the Son into the world to condemn the world, but in order that the world might be saved through him. Those who believe in him are not condemned.” We need to believe in God, in Jesus and in the Holy Spirit, so that we may be “born of water” – and this comes from choosing to engage with God and the Trinity. But the choice to engage is only the first step in the journey. In specifically choosing the word anothen, Jesus is telling Nicodemus that in order to enter the Kingdom of Heaven, it is both/and that is required – both born again, and born from above. Both born of the water and born of the spirit. Both converted through the Trinity, and fully surrendered through the spirit. And more, and he goes on to describe these sins as “evils.” As part of engaging with God, we need to surrender these parts of our lives, and be born from above through the Holy Spirit. Now you may think that it’s tough. Some may say that it’s impossible. I’m here to say that Nothing is impossible through God. Earlier this year, I was having thoughts that were thoughts I didn’t want to have. I won’t go into them here because it’s not the place, but suffice to say that these were evil thoughts that were preventing me from engaging with God. One night, I decided that I no longer wanted these thoughts. I surrendered myself to God, I prayed for help, to say that I no longer wanted to live like that. It’s still early days, but I can testify to you today that while the temptation of those thoughts still enters my mind, through the grace of God, I no longer entertain those thoughts, and the temptation disappears as quickly as it enters. It is possible to surrender these things to God, to be born from above, and in surrendering these things we engage more fully with God. Once coming into the light, having surrendered ourselves to God, to the Trinity, we need to then live in the light, for it is by living that we engage with God. Jesus said, “But those who do what is true come to the light, so that it may be clearly seen that their deeds have been done in God.” We need to surrender the parts of our lives that prevent us from engaging with God, but in doing so, we need to continue living in the light to engage with God, so that others can see that our deeds have been done in the light. But, what are those deeds? Well, it all comes down to the overriding principle in the Gospel – Love. In today’s reading, we had the famous line, “For God so loved the world that he gave his only Son, so that everyone who believes in him may not perish but may have eternal life.” God sent Jesus because he loved us. In Matthew, we read that the two greatest commandments are “Love the Lord your God with all your heart and with all your soul, and with all your mind.” And “Love your neighbour as yourself.” Or to put it another way, Love God supremely, Love others sacrificially, love yourself sincerely. Love. If everything we do comes out of a heart of Love – for God, for others, and for ourselves – then those deeds are in the light. We need to live in the world, to be engaging with God. If our deeds are not seen, then how can others see the light that we share? We need to be actively working to bring the love of God into the world. How? Find an issue that you are passionate about, and actively work towards bringing about change in this world. You may feel passionate about caring for God’s world – then get out there and live it! Start living in ways that bring the least harm to God’s earth. Or maybe you feel passionate about human rights and equality? Get out there, and fight for the rights of those who have no voice. Or maybe you want to care for the poor, the hungry, the homeless. Get out there and start doing something! For me, one of the things I’m passionate about is the rights of refugees, migrants and asylum seekers. So I’ll be marching in the Welcome to Australia March Together on June 23, to show my support to those that I’m passionate about. So find something that you’re passionate about, and engage with God by living in the light. 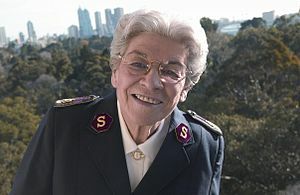 General Eva Burrows, talking about holiness – which is effectively what living a life surrendered of your sin – said “God sanctifies us in order to mark out character with the Spirit of Jesus, and then He wants us to take that same character out and mark the world with the Spirit of Jesus. True holiness engenders a compassion that will naturally reach out in ministry, mission and service.” We need to mark the world with the Spirit, With Jesus, with God – the Trinity. We do that through our ministry, our mission and our service. We engage with the Trinity – through choosing to engage, through surrendering our sins, and through living in the world. Where are you at today? Do you need to choose to engage with God? Do you need to surrender some area of your life that’s preventing you from engaging with God? Or are you ready to engage with God by living in the light? As we sing “This is my desire”, I invite you to, as the song says, to “honour” god. The Mercy seat – a place of prayer with God – is open to all. If you want to engage, feel free to come forward as we sing, or if you’re more comfortable stay seated. But Honour god, and engage with him today.